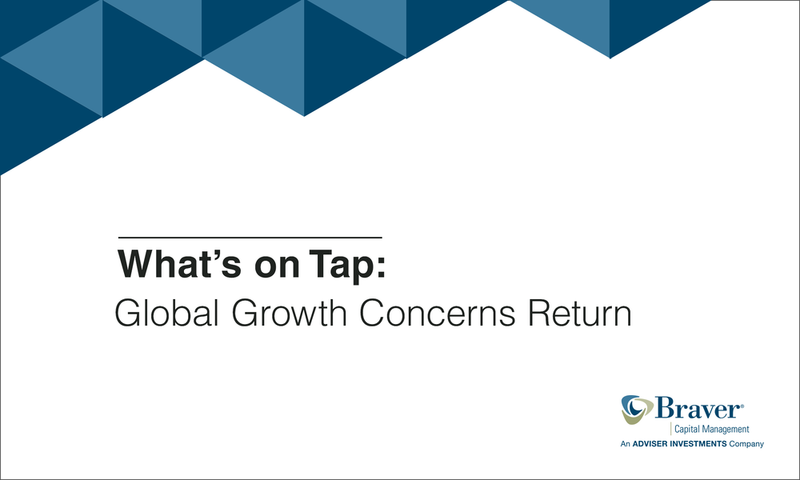 Global growth concerns returned last week, and traders grew jittery. But, as is often the case, they were reacting to headlines rather than the scant new economic data that was offered up. Considering what Federal Reserve policymakers did and said after their two-day meeting, we think the slow-growth, not no-growth economic path remains the course we’re on. Despite some downs and ups, for the year through Thursday, the Dow Jones Industrial Average and the broader S&P 500 have returned 12.0% and 14.4%, respectively. The MSCI EAFE index, a measure of developed international stock markets, is up 11.1%. As of Thursday, the yield on the Bloomberg Barclays U.S. Aggregate Bond index has dipped to 3.05% from 3.28% at 2018’s end. On a total return basis, the U.S. bond market has gained 2.1% for the year. This week, the Fed’s Open Market Committee (FOMC) unexpectedly backed away from its previous forecast of two interest-rate hikes in 2019 and is now suggesting there will be no hikes this year. The FOMC lowered its forecast for economic growth from 2.3% to 2.1% for 2019 and announced moves designed to maintain a higher-than-expected level of stimulus in our financial system. Despite full employment, low inflation and rising wages—good news for our consumer-driven economy—Fed Chair Jay Powell struck a cautious tone, saying the economy remains strong but not as strong as it was last year. He expressed even greater concern about global growth. Bond prices rallied on the news, and the difference, or “spread,” between yields on 3-month and 10-year Treasury bonds inverted for a brief period on Friday morning, meaning short-term bond yields were higher than those on long-term bonds. After moving higher midday, the 10-year Treasury yield declined back into inversion territory as we were going to print. These moves are noteworthy because an “inverted yield curve” suggests that investors lack confidence in the economy’s growth prospects. In fact, the past five recessions have been preceded by an inverted yield curve. However, as we’ve noted before, this recession warning signal is often quite early, leading recessions by anywhere from 11 to 24 months in recent cases. We do not seem to be at a recession inflection point yet, but the inverted yield curve suggests we may be getting closer. We neither discount nor dismiss this signal; instead, we analyze the conditions that are driving it and continue to think calls for an imminent U.S. recession are ahead of the facts. In about two weeks, companies will begin reporting their earnings for the first quarter of 2019. As always, there will be plenty of pundits and prognosticators claiming to know how to trade ahead of any known facts. We prefer disciplined investment to such speculation. What might distract investors and traders from focusing on earnings in the weeks ahead? The usual suspects: U.S.-China trade talks, Brexit, forecasts of global growth and the Mueller investigation. The greatest speculation will come with release of the special counsel’s report and we expect the media onslaught will be matched by bouts of market volatility. As to what drives markets most sustainably—namely, earnings—our tactical investment strategies are designed to react to the changing trends no matter what they portend for our markets and our economy. Spring is in the air, and many homeowners are rolling up their sleeves to start their next big home improvement project. But before you put hammer to (or through) drywall, it’s worth reviewing how you’ve insured your home to make sure you have adequate coverage. Are you insuring your home as well as the land it’s built on? You shouldn’t base your replacement coverage on your home’s appraised value; this will include the value of your land. To get a true estimate of the value of your physical home, base your estimate and coverage level on recent per-square-foot replacement costs in your area. This information should be available from your local homebuilders’ association. In the event of a total loss, will my insurance cover replacing all of my personal property? As you’re reading your policy, determine whether the contents of your home are insured under “replacement cost” or “actual cash value.” If your favorite armchair gets ruined, actual cash value will pay you what it’s worth today. Replacement cost coverage will replace your chair with a new one of like kind and quality. We recommend the latter option. Is my liability coverage sufficient and do I have other coverage that might apply? Have you installed a swimming pool or trampoline since you last reviewed your liability insurance? You might want to consider raising your coverage. Many homeowners who also own and insure cars or boats often purchase a “liability umbrella” that can provide blanket coverage for any liabilities you might be subject to. Note that you may have to increase your underlying liability coverages through your homeowners or car insurance when purchasing an umbrella policy. Why? These policies typically require a certain minimum underlying coverage level; if you are below that, you will need to increase it before you can buy the umbrella insurance. What isn’t covered in my homeowner’s insurance? Insurers offer both “open-perils” and “named-perils” policies. A named-perils policy only covers losses that are listed in the policy. Open-perils policies insure against all losses, except for those that are specifically excluded in the policy. If you have the latter type, it’s important to review those exclusions. You may find that losses due to common hazards (termites, mold) or natural disasters (floods, earthquakes) aren’t covered. If you’re living in an area where you are at risk for one of these natural occurrences, consider separate insurance. If a review of your documents has turned up some deficiencies or you aren’t clear on what is or is not covered, don’t hesitate to contact your insurance agent; they should be able to explain what you have or offer you alternative coverage options. Next week will bring more insight into the housing market, with reports due on new constructions, permits, prices and pending sales. We will also be getting consumer-related data (income, spending, savings, confidence and sentiment), a revision of fourth-quarter economic growth and inflation gauges. Please note: This update was prepared on Friday, March 22, 2019, prior to the market’s close.